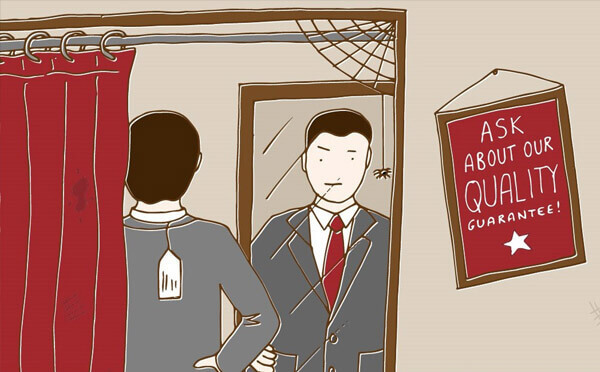 CEO’s Blog – When was the last time you visited your shop floor? 1st April 2019 – I don’t have to read the FT to know that M&S’ sales are in trouble. You can judge the health of any business from its shop floor. I don’t have to read the FT to know that M&S’ sales are in trouble. You can judge the health of any business from its shop floor. So when I visited the M&S flagship store in Marble Arch and found myself in the dirtiest, dingiest changing room I have ever seen, I knew that the chain was struggling. I had gone in to buy a suit and was shocked by the state of the place. I talked to a sales assistant and asked why the changing area was so filthy. She apologised but was clearly not too fussed about the issue. So I found a manager and asked him what was going on. He was appalled and promised the issue would be sorted. There was a massive disconnect between the management and the shop floor staff at that branch – and the business has suffered for it. Lo and behold, when M&S published its annual results back in November, clothing sales were down. When was the last time you spent some time on your shop floor? You don’t have to physically own shops – this just means spending time with your frontline employees. I run a clinic, where I spend 20 minutes with people from all over the business. Some days I’m with customer service, another day sales or software development. There is absolutely no substitute for speaking to these colleagues. They will tell you things that your managers can’t or won’t. It’s the only way to truly judge what’s going on at the coal face and understand what your customers see when they interact with your company. I have spent a lot of time in many departments sitting with team members and helping to identify bottle necks, improvement opportunities and also ways of streamline activities. You can have the best technology, but you must complement this with humans. Take everyone on the journey with you get everyone being leaders. The key to generating insights – insights that could ultimately make or break your business – is to formalise the process. Host clinics like mine every Friday – that’s the day when most people like to unwind before the weekend, so they’re more chatty than usual. Be respectful of people’s opinions – hear them out. Most importantly, promise confidentiality. People won’t talk to you if they think you’ll reveal your conversations to their colleagues. Do this, and believe me, you’ll save yourself hundreds of thousand in consultancy fees. As your business grows, this process will also help you keep your feet on the ground and your mind focused on what’s important. What are you waiting for? Previous PostA conversation with Steve Herbert: A field operations and logistics expert with 20 years experienceNext Post3D printing – will it really make a difference in the service sector?